Get used boat values and used boat pricing using BUC's sophisticated searching algorithms designed specifically for locating the used boat prices and values of a boat. You can get values for sailboats, powerboats, houseboats, motor yachts and other marine vehicles. To find used boat resale values, fill out our simple used boat specification form. Make sure to select the proper category - powerboat, sailboat, houseboat or other. Click Submit. Then click the desired boat from the list to view the used boat value. The used boat resale value will be shown as a retail low to high price range. Find used boat prices fast! GET YOUR FREE BOAT VALUE! 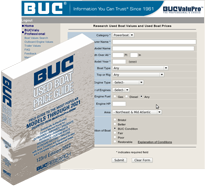 The BUC Used Boat Price Guide contains used boat prices, area, condition and equipment scales and a complete cross-referenced index. to get used boat resale prices of sailboat, powerboat, motor yacht, houseboat, catamaran, multihull and other used marine vehicles. Order your copy of the BUC Book today. Without help from an expert, determining a used boat value is a complicated and inexact process. Your solution is BUCValu, the most current and accurate online resource for used boat evaluations. BUC International Corp. combines over 40 years experience in used boat pricing with the latest econometric techniques to provide you with the most accurate retail market values. Our used boat pricing service will show used boat resale values and used boat retail prices. Using these retail boat prices, you can also estimate a wholesale used boat trade-in value. BUCValu Professional is a subscription-based service for marine industry professionals who require comprehensive, detailed boat evaluations. BUCValuPro is updated continuously, adjusts the used boat value based on the location and condition of the boat and allows unlimited displays of all possible matches for each query. Find out more or purchase a membership. BUCValu Consumer is a free online used boat valuation service for current or prospective boat owners who want to learn the market value of one particular boat. Estimate your used boat resale value here with BUCValu. Click here to get yacht and boat values.